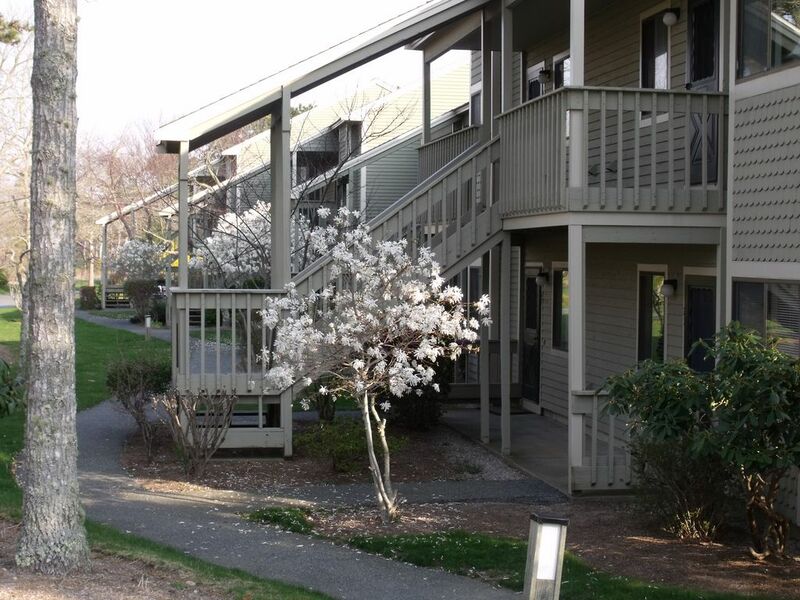 Rent from Saturday to Saturday.-- Our Cape Cod 2 bedroom 2 bath condo is perfectly located in Brewster Mass. This rental in the center of the beautiful Ocean edge Country Club and Resort just a mile from Cape Cod Bay. Our ground level unit has a nice view of the golf course out back an is a short walk to the Fletcher pool complex and a beautiful five minute walk to the Arbor Pool and Shark Bar with the Links Tavern across the way. Please check out the Ocean Edge Resort there is way to much to describe. The best thing of course is that your on the Cape. There is so much there starting with the fresh air and clean cold ocean. Our National seashores have plenty of big waves and gorgeous beaches with the seals swimming by. We love the Bay with the warmer calm waters, including long walks at low tide, great salt water fishing and the beautiful sunsets. This property connects with the Cape Cod Rail Trail, you can ride your bike for miles with plenty of fun stops along the way. For the nature lovers we are right next door to Nickerson State Park. Go swimming in the spring fed Kettle ponds, kayak, fish or just hike through the park. Enjoy great day trips to Province town one way or Hyannis the other. Jump on a ferry to Nantucket or The Vineyard and whale watch along the way. Your going to need a day just to hang out at one of the Ocean Edge pools. We really love to see a play at one of the several play houses near us but our absolute favorite thing to do is eat what I believe is the best seafood anywhere. I could go on and on about the Cape from the great little shops the Cape league Baseball to the drive in movies but you'll see. The condo is extra clean with leather furniture and Pergo flooring. The main bedroom has a queen bed with memory foam toppers, a private bath, large TV DVD. The second bedroom has 2 twin beds also with toppers an TV/DVD. The living room with its AC and big screen TV offers a Queen pullout allowing you to sleep 6. The dinning area seats 6 around the marble table top. Our kitchen with its granite counters provides you all the amenities of home. Sliders off the living room lead to a furnished patio with a gas and charcoal grills. We also have washer/dryer dehumidifier cable TV and WIFI. Our condo is rented for 7 night stays only. From Saturday to Saturday. Check in 3:00 PM. Check out 10:00 AM. No pets no smoking allowed. We do NOT provide towels or bed linens. This property allows you to purchase 6 pool passes. $17 dollars or $55 for the week for adults. $7 per day or $25 for the week for the kids. Under 5 is free. You can buy the passes from The Ocean Edge Resort located on the property. Cable didn’t work in one of the bedrooms. A couple of outlets didn’t work. also top plugs on the outlets work off switch in each room. Clumps of black dog hair everywhere: we had to leave the unit immediately. We rented this unit for a family trip on Memorial Day weekend. We checked in late Friday night and found the unit floor to be covered in black dog hair. This was visible in clumps on the floor in every room, on some furniture and even inside the fridge. Several of my family members are allergic to dog/cat dandruff and started to complain of stuffy nose within minutes of us entering the unit. Please note that this rental was clearly marked as PET FREE, which was one of the reasons we chose it. We texted the owner (with no reply, granted it was after 10 pm) and were forced to leave and drive back home to Boston, with great disappointment and frustration of the entire family. We immediately began a process to receive a refund of our rental money: this dragged until the end of July, and eventually we were given no refund at all. We followed HomeAway instructions and negotiated a refund with the owner and then filed a formal complaint with HomeAway itself, to no avail. Buyer beware: dogs live in this unit, yet it is marked PET FREE. Unless you are used to live with animals who shed their hair everywhere, you will not be able to enjoy this rental. If you are allergic to dog dandruff you cannot last inside the unit more than a few minutes. This is not a complaint about a dirty unit: the place looked clean when we checked in, however the it is evidently overrun with pets and cannot be adequately sanitized. This was an extremely disappointing experience overall, which has also made me weary of renting on HomeAway, because of how poorly the refund process was handled.